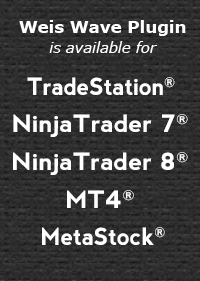 Trades About To Happen begins with a model of where trades most frequently appear on charts of all time periods. These trades occur around the edges of trading ranges and are described in subsequent chapters dealing separately with springs, upthrusts and absorption. They are the action signals of the Wyckoff method. Numerous examples of these key types of behavior are included. The use of lines is emphasized to show the trader how to understand larger structures on charts. Bar-by-bar chart studies are presented in the chapter entitled The Logic of Reading Bar Charts. It undoubtedly will be considered one of the most important discussions in the book. 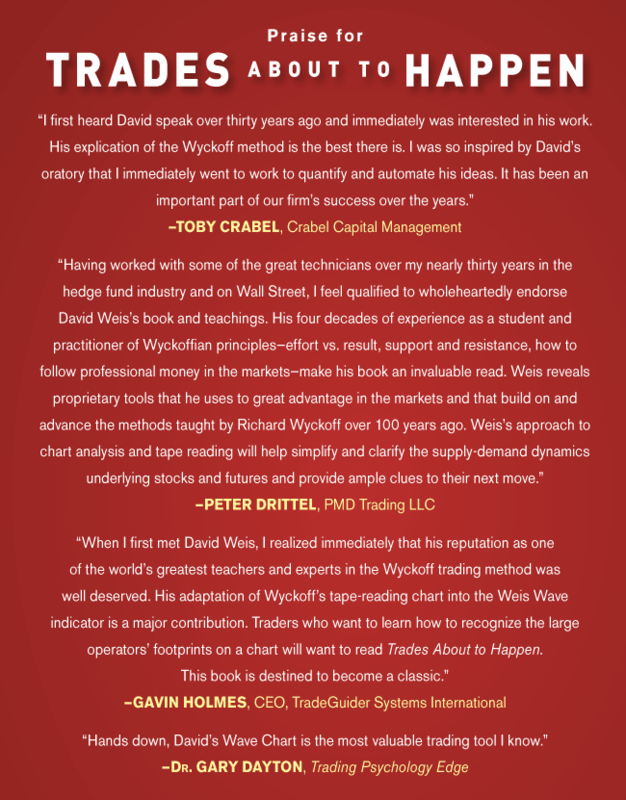 Two chapters explain the workings of the Weis Wave indicator and its evolution from Wyckoff’s original tape reading charts. Nowhere else can one find such detailed information on the Weis Wave. The final chapter includes a discussion of point & figure and renko charting. Wave volume is incorporated into both to give them added usefulness. 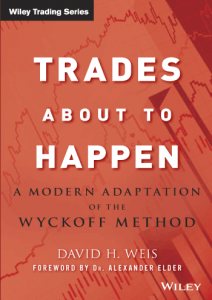 For the trader interested in a succinct, modern treatment of Wyckoff’s methods, Trades About To Happen is a must read. NOTE: All book buyers will receive a link to a downloadable digital file of the charts shown in the book. This will enhance your study of the material as the charts can be be viewed online with as much detail as you like or printed as full-sized charts.